A double shooting that claimed the life of a 70-year-old Scarborough man was caught on a nearby surveillance camera. The shooting occurred outside of a Toronto Community Housing residence in the area of Victoria Park Avenue and Morecambe Gate, shortly after 11:30 p.m.
Police were called to the scene, where they found two men with gunshot wounds inside an older model van. They were told that the men had been sitting in the parked van when they were approached by a male suspect. A second male suspect was at the scene, but kept watch from a short distance away, police said. The suspect who approached the van shot both the driver and the passenger in the front seat, police said. On Thursday afternoon, police released surveillance camera footage of the incident. The video, which was posted to YouTube, shows a man step over a low fence and approach the passenger's side of the van. Two flashes of light are visible at the end of what appears to be a gun held by the suspect. The man can then be seen running in the opposite direction. One of the shooting victims was pronounced dead at the scene. He was later identified by police as 70-year-old Alva Dixon. The other victim, believed to be in his 40s, was taken to hospital with non-life-threatening injuries. 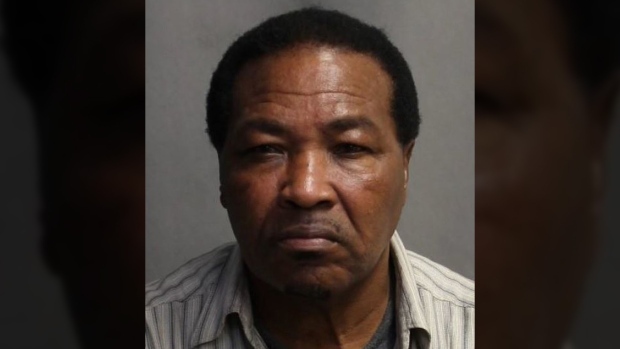 "It is an incredibly cowardly act of a person sneaking up on a 70-year-old man and firing several shots at him," Toronto Police Det. Jason Shankaran told reporters on Thursday. "We believe someone in that van was the intended target." No arrests have been made but police say they believe two suspects fled the scene. Officers released two photos of one of the suspects believed to have been involved in the shooting, in addition to the video, hoping that someone will recognize the man in the photos. Police are asking anyone with information to call 416-808-4200 or Crime Stoppers at 416-222-8477 (TIPS).